Indian Hockey Federation (IHF) faced yet another embarrassment on the eve of the inaugural Premier Hockey League when a senior vice-president rebelled against the federation, questioning its functioning. Terming the Indian Hockey Federation (IHF) as a “big mad house”, former hockey team coach Gerhard Rach today unleashed a spate of attacks on IHF secretary K. Jyotikumaran. Striker Sameer Dad scored the solitary goal as Hyderabad Sultans got the better of Sher-e-Jalandhar 1-0, in the opening league match of the Premier Hockey League here today. England weathered an early assault by South Africa to reach 77 for one on the opening morning of the fourth Test in Johannesburg today. A fine spell of bowling by Amit Bhandari (5 for 36) and Chaitanya Nanda (2 for 29) and a blistering knock of 131 not out by young batsman Shikhar Dhawan helped Delhi crush Himachal Pradesh by 107 runs in the one-day Ranji Trophy match here today. Chasing a target of 266 runs, Himachal Pradesh crumbled to fine rival bowling attack. Punjab scored a convincing eight-wicket win over Jammu and Kashmir in the Ranji Trophy one-day match a Dharamsala today. Batting first, Jammu and Kashmir put meagre 157 on the board before being bundled out. Punjab overhauled the target for the loss of two wickets in just 27.4 overs. Haryana suffered a shocking 43-run defeat at the hands of Services in the North Zone Ranji Trophy one-day league encounter here today. Haryana were yet to win any of their matches, having lost earlier on to Punjab and Himachal Pradesh. For Services, this was their second successive win in three matches. The Pakistan Cricket Board (PCB) will not send any security delegation before the team’s tour of India in February-March, but a venue inspection team will visit the places to monitor the facilities, a board official has said. Bangladesh, savouring their maiden Test win, go into the second and final cricket Test against Zimbabwe at the Bangabandhu National Stadium here from tomorrow hoping to secure a 2-0 sweep of the series. Roger Federer and Lindsay Davenport were named today as the top seeds for the men's and women's singles at the Australian Open which starts on Monday. Swiss world number one Federer, who won last year's title as well as the Wimbledon and U S Open crowns, topped the men's list ahead of American Andy Roddick and Australia's Lleyton Hewitt. Australia’s Lleyton Hewitt kept his cool on a blistering hot summer day to reach the semifinals of the Sydney International today while his main rivals all melted. A top pre-race favourite from Kenya, a country which produces long distance runners of world class through a seemingly endless assembly line, expects faster times in this Sunday’s Standard Chartered Mumbai Marathon due to cooler weather conditions and easier course as compared to last year. Former Indian under-19 coach Robin Singh has taken up a job with the Hong Kong national cricket team and will not be available for the colts’ upcoming series against England. Indian chess wizard Viswanathan Anand will be eyeing a hat-trick in the Corus Chess Tournament which gets underway here tomorrow. And if he bags the title, he would be the first player to win the championship five times. Anand has won the title of the first big chess event of the year in 1989, 1998, 2003 and 2004. A brace by Sebastiao Endro guided Fransa Football Club to a 2-0 win over Vasco in the opening round of the ninth ONGC National Football League, played at Nehru stadium here today. The match started at a fast pace, with Vasco controlling the game in the first half. Vasco’s newcomer Brazilian Sidney Rodrigues had a good match as he controlled the midfield effectively. Star-studded Haryana State Industrial Development Corporation (HSIDC) will make their maiden appearance in the Asian Champions Clubs Volleyball Tournament, which will be organised in Islamabad from June 1 to 8. This is the first time that the Volleyball Federation of India will send its champions club in the Asian clubs competitions. IHF senior vice-president Narinder Batra shot off a letter to secretary K. Jothikumaran, inquiring about the expenses incurred by him and president K.P.S. Gill and amount received from the Union Youth Affairs and Sports Ministry and sponsors and how much of it was spent on the players in the last couple of years. He also alleged that while the federation was quickly paying dues to some people, it owed money to some other people who had been made to wait for three years. Mr Batra also demanded the audited balance sheet from the IHF secretary. He pointed out that though the IHF had convened a general body meeting in Hyderabad on January 30, minutes of the previous meeting and the secretary’s report were not sent to the federation officials. He also criticised Mr Jothikumaran for convening the meeting but keeping the official in the dark about the Premir Hockey League and the National Hockey Championship. “Though the notice is sent on time, an effort has been made not to send any document with it so that members are forced to pass everything without having read it properly,” he alleged. Earlier this month, Mr Batra was made a member of the Jury of Appeal for the Premier Hockey League, which kicked off in Hyderabad today. “They can throw me out if they want for raising these objections. If they do that, I will definitely go to court because it is public money that is being misused,” said the angry official. Mr Batra also said he would contest against the IHF president in the coming elections. “The elections are due in 2006. If there is no candidate to contest against Gill, I will stand against him. I have already sounded him about it,” he said. Miffed by Mr Gill’s recent comments against players like Gagan Ajit Singh he said whatever statements the IHF boss had made were his personal views and the IHF did not endorse those. Rach, who yesterday informed the IHF about his decision to quit, said IHF president K.P.S. 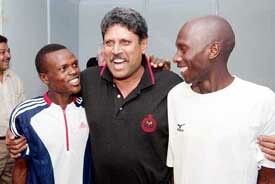 Gill was in favour of giving him the post till the 2006 World Cup, but it was Jyotikumaran who was against him. “After the Olympics, Gill was happy with me, but Jyotikumaran was not. He said to me that I was not able to handle the team, especially Dhanraj Pillay,” he added. “Then he said you should pray that the old man is alive for a long time. 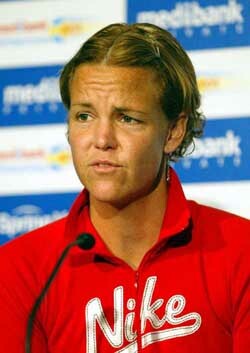 If he is dead, you will no more be the coach of India,” Rach alleged in an interview to a private news channel. With both teams locked goalless in the first two quarters, Hyderabad Sultans stepped up the tempo in the third, constantly raiding the opponents’ citadel from both wings. England weathered an early assault by South Africa to reach 77 for one on the opening morning of the fourth Test in Johannesburg today. The touring side, choosing to bat in humid conditions and on a pitch expected to favour seam bowling early on, were given a torrid time by Shaun Pollock, but Andrew Strauss hit back to reach 40 not out. Robert Key was on 16 after fast bowler Dale Steyn removed Marcus Trescothick cheaply. England’s openers saw off the new ball, which was shared by Pollock and Makhaya Ntini, and looked unruffled despite playing and missing repeatedly. Two balls after the drinks interval, Steyn struck, Trescothick feathering behind for an unconvincing 16. He faced 47 balls. Steyn played in the first two Tests in Port Elizabeth and Durban, but was left out in favour of seamer Charl Langeveldt for the third Test in Cape Town. But he returned when Langeveldt fractured his hand and opened with four maidens as well as one wicket. He reached the break with one wicket for 14 from seven overs. Pollock deserved more from his opening burst of seven overs for 18, but was punished whenever he strayed, Strauss cutting and driving him for four boundaries. South Africa also brought back wicketkeeper Mark Boucher, with struggling batsman Hashim Amla left out. A.B. de Villiers, who kept wickets in the last two Tests, was selected as a batsman. England opted for swing bowler James Anderson instead of fast bowler Simon Jones in their only change. Michael Vaughan won the toss for the first time in the series. A fine spell of bowling by Amit Bhandari (5 for 36) and Chaitanya Nanda (2 for 29) and a blistering knock of 131 not out by young batsman Shikhar Dhawan helped Delhi crush Himachal Pradesh by 107 runs in the one-day Ranji Trophy match here today. Chasing a target of 266 runs, Himachal Pradesh crumbled to fine rival bowling attack. Sangram Singh (33 runs), Virendra Sharma (32 runs) and Manvinder Bisla (33 runs) were the main scorers as Himachal were bowled out for 159 runs. After their shock defeat to Punjab at Dharamsala on Tuesday, the star-studded Delhi came in an aggressive mood right from first ball and scored 266 for 4, thanks to fine knocks of 131 not out by opener Shikhar Dhawan and 76 by Rajan Gupta. Dhawan's knock included a mighty six and 12 fours. After the early departure of opener Gautam Gambhir on 5, Shikhar Dhawan and Rajat Gupta played freely and took the team total to 200 runs when Gupta was caught by Kuldip Diwan off Vikramjit Malik for 76. Dhawan scored his century in 128 balls and hit the ball to all sides of fence. Rajat Bhatia scored 17, while former international Ajay Jadeja contributed 13 as Delhi posted 266 on the board. For Himachal Pradesh, Ashok Thakur was the most successful bowler. He took 2 for 44 runs. The hosts were guilty of dropping many catches which helped the Delhi to amass such a huge score. Chasing this total, Himachal were never really in the hunt. Wickets kept on tumbling one after the other. Small contributions from Sangram Singh, Manvinder Bisla and Ajay Mannu were of no avail as the side was bowled out for 159 in 42.4 overs. Shikhar Dhawan of Delhi was adjudged Man of the Match. Delhi: Shikhar Dhawan not out 131, Gautam Gambhir b Ashok Thakur 05, Rajan Gupta c Kuldip Dewan b Vikramjit Malik 76, Rajat Bhatia lbw Kuldip Dewan 17, Ajay jadeja b Ashok Thakur 13, Mithun Minhas not out 02. Extras: 22 Total:(for 4 wickets in 50 overs) 266 Fall of wickets: 1- 24, 2- 200, 3- 240, 4- 264, 5-266. Bowling: Vikramjit Malik 9-0-50-1, Ashok Thakur 10-01-44-2, Sangram Singh 8-0-25-0, Virendra Sharma: 4-0-21-0, Kuldip Dewan: 9-0-49-1, Saurav Rattan: 3-0-23-0, Vishal Bhatia: 7-0-43-0. Bowling: Amit Bhandari 10-0-36-5, Rajat Bhatia 5-0-16-0, Ajay Jadeja 4-0-10-0, Ashish Nehra 6-1-11-1, Chaitnaya Nanda 9.4-0-29-2, Sanjay Gill 8-0-48-1. Jammu and Kashmir looked clueless facing seamer Gagandeep Singh, who wrecked the innings with a three-wicket burst. Leg-spinner Sandeep Sawal, though expensive, also claimed three wickets as Jammu and Kashmir were bundled out for paltry 157 in 48.5 overs. This was never going to challenge mighty Punjab batting, which they achieved with plenty to spare. All rounder Reetinder Sodhi, who remained unbeaten on 62, and India one-day player Yuvraj Singh contributed 63 to ensure that Punjab emerge a comfortable winners. Fall of wickets: 1-3, 2-9, 3-9, 4-59, 5-60, 6-147, 7-149, 8-150, 9-154, 10-157. Fall of wickets: 1-17, 2-148. Bowling: Abid Nabi 9 0 56 1 Shafqat Baba 6.4 1 46 0 Ishtiyaq 4 0 27 0 Inderjeet 4 0 13 0 Jagtar Singh 3 0 11 0 Dhruv Mahajan 1 0 1 1. Electing to bat first after winning the toss Services riding on a fine knock of 79 runs by Yashpal Singh, piled up 207 runs. 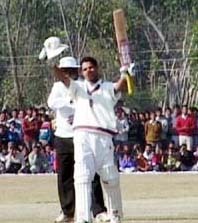 For Haryana, medium-pacer Joginder Sharma and Sachin Rana took two wickets apiece. Haryana began their innings disastrously, losing their first four wickets with just 15 runs on the board. Their innings folded up at 164. Services medium-pacers Sudhakar Ghag and Fazal Mohammad were the architects of their sides victory. Services: Narinder Singh run out 30, P.M.S. Reddy b Mohinder Sharma 8, Jasbir Singh c Ajay Ratra b Sunny Singh 14, Yashpal Singh c and b Sachin Rana 79, Sarabjit Singh c Ajay Ratra b Joginder Sharma 11, Sanjeev Mushra not out 32, Rajbir b Sachin Rana 1, Fazal Mohammad not out 5. Fall of Wickets: 1-10, 2-60, 3-66, 4-101, 5-196, 6-199. Bowling: Joginder Sharma 10-0-41-2, Jatinder Mullick 4-0-20-0, Sunny Singh 10-0-27-1, Sachin Rana 6-0-43-2, Gaurav Vashist 10-0-34-0, Amit Mishra 10-0-33-0. Haryana: Chetan Sharma c Sarabjit b Fazal 1, Bhageshwar c and b Sudhakar Ghag 1, Sunny Singh c Yashpal b Fazal 0, Safqat Khan c Sarabjit b Sudhakar Ghag 7, Ajay Ratra run out 17, Deepak Joon c Rajbir Singh b Sudhakar Ghag 43, Joginder Sharma c Yashpal b Arun Sharma 29, Sachin Rana c and b Fazal 25, Amit Mishra c Jasbir Singh b Yashpal 11, Gaurav Vashist not out 16, Jatinder Mullick lbw Sudhakar Ghag 0. Fall of Wickets: 1-2, 2-2, 3-6, 4-15, 5-49, 6-105, 7-117, 8-136, 9-163, 10-164. “It will not be a security delegation, but a venue inspection committee, because we want to be satisfied with the level of facilities and other arrangements at the venues where they want us to play,” PCB director Abbas Zaidi was quoted as saying by The News. Mr Zaidi also said the board would like to play most matches in areas close to the Wagah border. “It is a tour we are all looking forward to because of the significance attached to it. So we are keen that we play at some venues which are close to the Wagah border and people can travel by road from Pakistan to watch the matches,” he said. Bangladesh, winless for 34 matches after receiving Test status in 2000, ended the drought earlier this week when they hammered the depleted Zimbabweans by 226 runs in the opening match in Chittagong. Captain Habibul Bashar was confident his team will win the series. “We realise our job is only half done and the boys are keen to wrap up the series,” said Bashar, who top-scored in both innings of the first Test with knocks of 94 and 55. Bangladesh coach Dav Whatmore said his side faced a different kind of pressure. “Before our maiden win, there was pressure because we had not won. Now the pressure is because we are expected to win,” said Whatmore, the former Sri Lanka coach who joined Bangladesh last year. Zimbabwe’s West Indian coach Phil Simmons felt his inexperienced team, deprived of leading stars like Heath Streak and Grant Flower because of a players’ revolt against the establishment, was capable of providing stiffer resistence in the second Test. Zimbabwe captain Tatenda Taibu felt his team could do better than their effort in the opening match. “We did not apply ourselves well enough in Chittagong and our shot selection was poor,” said Taibu, who led Zimbabwe in their first Test since June last year. Zimbabwe’s Test programme was put on hold by the International Cricket Council for fielding weak sides following a row between their cricket board and the senior players. Last year's runner-up, Russia's Marat Safin, was seeded number four ahead of Spanish Davis Cup hero Carlos Moya and Argentina's French Open finalist Guillermo Coria. Four-time Australian Open champion Andre Agassi was listed at number eight. The 34-year-old American is the oldest man in a singles draw that features the world's top 20 players. American Davenport has not won a grand slam title since her victory at Melbourne Park five years ago but was installed at the head of the women's seeds after finishing last year top of the world rankings. Frenchwoman Amelie Mauresmo, the 1999 Australian Open runner-up, is seeded number two ahead of four Russians, French Open champion Anastasia Myskina, Wimbledon winner Maria Sharapova, U S Open champion Svetlana Kuznetsova and Elena Dementieva, runner-up at Paris and New York. There were seven Russians among the women's 32 seeds. The 2003 Australian Open champion Serena Williams was seeded number seven after missing last year's tournament through injury. Her elder sister Venus was number eight in a field containing 17 of the world's top 20 women. 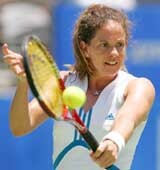 The three absentees are last year's champion Justine Henin-Hardenne, her fellow Belgian Kim Clijsters, runner-up in 2004, and American Jennifer Capriati, the champion in 2001 and 2002. Australia’s Lleyton Hewitt kept his cool on a blistering hot summer day to reach the semifinals of the Sydney International today while his main rivals all melted. The world number three breezed into the last four of the Australian Open warm-up event with a 6-1, 7-6 win over Swede Thomas Johansson to be the last remaining seed in the men’s draw. Fourth seed Romanian Andrei Pavel, Spanish fifth seed Feliciano Lopez and Taylor Dent, the big-serving American seeded eighth, all succumbed to lower-ranked opponents as the temperature at Sydney’s Olympic tennis centre soared to 42°C. Pavel fell to little-known Czech qualifier Ivo Minar 2-6, 7-6, 6-4 while Lopez succumbed to Radek Stepanek 6-3, 6-2. Dent failed to finish his quarterfinal with Max Mirnyi of Belarus, quitting halfway through the first set after feeling ill.
“I was feeling a little bit light-headed and dizzy and my energy was going pretty fast,” Dent said. “I saw the doctor and told him what was happening. He said just try and stay out there, but it was getting worse,” he said. The carnage was not just restricted to the men’s singles. India’s Leander Paes twisted his foot during a doubles match and was in doubt for the Australian Open while Czech Tomas Berdych also quit the doubles after suffering from a stomach problem. In the women’s draw, Russia’s world number 13 Nadia Petrova quit her match against Chinese amateur Peng Shuai because of heatstroke. The fifth seed was trailing 6-3, 4-2 at that time. Of the five Russian women who entered the event, only third seed Elena Dementieva remained in the draw. The French and US Open finalist beat Swiss Patty Schnyder 6-4, 1-6, 6-1 to set up a possible semifinal with world number one Lindsay Davenport. Joseph Kahagu, the 32-year-old marathoner, who is the entrant with the best recorded time in this year’s event two hours, seven minutes and 59 seconds, which he clocked seven years ago in the Chicago marathon said at a pre-event press conference here today that he expected a sub-2:15 winning time this year. This compared favourably with 2:15.47 clocked by Hendrik Ramala of South Africa, absent from the fray this time around. Citing reasons for this expectation, UK-based Elite athletics co-ordinator Ian Ladbrooke said last year, the event was held in February, when the temperature was 10 degrees more and the humidity level was also much higher than the expected weather forecast for Sunday. There were two uphill sections on the route too, which had been reduced to one this year, he pointed out as another reason for his optimism that the times clocked by the top runners would be much better this year. This year’s field was much stronger too, Kahagu said, a fact endorsed by Ladbrooke, who said he expected pretty good times to be set by the leading runners this year. Kahagu had come here after winning the Dubai marathon in 2003, clocking 2:09.23, which was a course record. He had taken part in the 1996 Pune marathon at the beginning of his career. He had won marathons in 2003 in Japan and last year in Madrid. “In fact, I wanted to run in the Mumbai marathon last year, but my manager dissuaded me as I was to run in Madrid soon afterwards,” Kahagu said. Asked about the Pune marathon, in which he took part, Kahagu described the conditions then as very hot and said he clocked 2:25. Another top Kenyan marathoner, John Mutai, who was fifth in the Mumbai marathon last year, said he adopted the waiting tactics last year and saw the course and conditions were quite tough. “Last year, I was cautious. I followed everybody and towards the end, it was tough and I saw many drop behind,” he recalled. “I have trained quite hard for the event, running 120 km every week. I saw the great Paul Tegart too training very hard for the coming season, the 37-year-old Mutai said, adding that Sunday’s race should be a good race. England’s 34-year-old Ian Fisher, for whom this would be his first marathon in Asia, said his training included wearing warm clothes while running to get used to the higher humidity in Mumbai. Robin Singh has signed up a two-year contract after being associated with the Hong Kong national side for the past one year. “I have not taken up a permanent job, but signed a two-year contract with Hong Kong,” Robin Singh said today. “Hong Kong are at the critical stage of their campaign to qualify for the ICC Inter-Continental Cup. With the final stages of the event clashing with the one-dayers against England, I could not have left them midway,” he said. The India U-19 side is to play three Tests and five one-dayers at home against England. The first Test begins in Bangalore on January 22. The super Grandmaster performed brilliantly last year winning in Dortmund, rapid events at Mainz, in Sao Paulo and Corsica besides taking India to their best-ever finish, a sixth place, at the Chess Olympiad. ''Being the first in the calendar year, players are motivated to start the year on a good note. Coming after a good break, chess players tend to be better prepared and have studied a lot of theory and opening preparation,'' Anand predicted. HSIDC, captained by Indian senior skipper Amir Singh, qualified for the Asian clubs meet after dethroning South Central Railways 28-15, 25-22, 27-25, 28-26, 15-10 in the final of the National League Championship recently in Hassan (Karnataka). Two teams each from Iran, Qatar and Saudi Arabia and one each from India, Japan, Bahrain and Korea will compete in the Islamabad championship. The HSIDC team: Amir Singh, Raghuveer Singh, Sanjay Kumar, Dinesh Kumar Singh, Jitender, Sube Singh, Gurpreet Singh, Darshan Singh, Rampal Singh, Surjit Singh, Sandeep Kumar and Anil. HSIDC is also allowed to include two “guest’” players in their team for the Asian clubs championship. Meanwhile, the Volleyball Federation of India has appointed Mr Randhir Singh chairman of the disciplinary committee of the federation. Trials to select the Patiala district badminton teams for men and women will be held at the polo ground on January 15 at 4.30 pm. The selected team will take part in the Punjab State Badminton Championship slated to be held at Jalandhar from January 20 to 22. Trials to select the Patiala team in veterans category (above 45), which will also take part in the state championship, will be held on January 16 at 8 am. 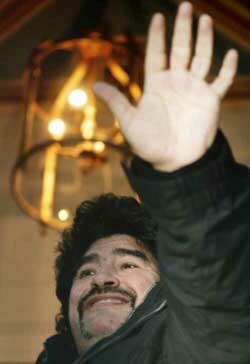 Argentine soccer legend Diego Maradona waves to reporters in Athens on Thursday. Maradona is in Greece on a two day visit.